A major milestone in PostgreSQL 9.0 is Streaming Replication(including DDL). Many of you all used configuring SR on Linux, but I would be presenting SR on Windows Platform. PostgreSQL wiki is the best guide for setting up the Streaming Replication. For setting up SR on Windows, I would recommend to follow the PostgreSQL wiki steps with minor changes what needed for Windows Platform. I would like to show only the changes what you have to look for on Windows Platform in my blog. On primary, you need to configure the accepting port. Below link will guide for adding port. Note: Adding the port differ's from different Windows Platforms. On Primary, changes in PostgreSQL.conf. 1) Edit the postgresql.conf file and change the below parameters. Note: Create the recovery.conf file by copying any of the .conf files from the /data_directory. Mentioned steps are the only changes you need to take care when setting up SR on Windows, rest all follow the procedure on PostgreSQL Wiki. 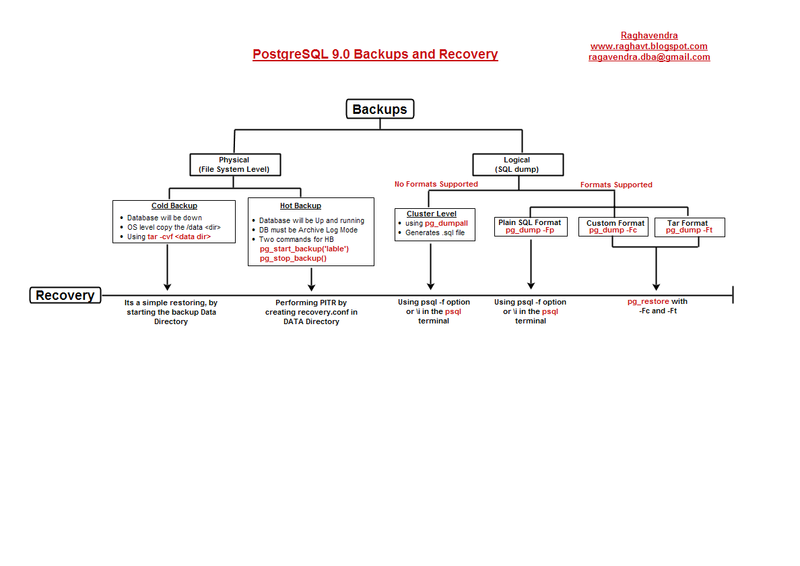 In PostgreSQL, Backup & Recovery are very user friendly comparing with other database. Many of them won't agree to this, ok lets not get into debate. Coming to Backups, PostgreSQL does'nt support INCREMENTAL BACKUP, however there are very consistant backup tools and OS level work-around to achieve this goal. 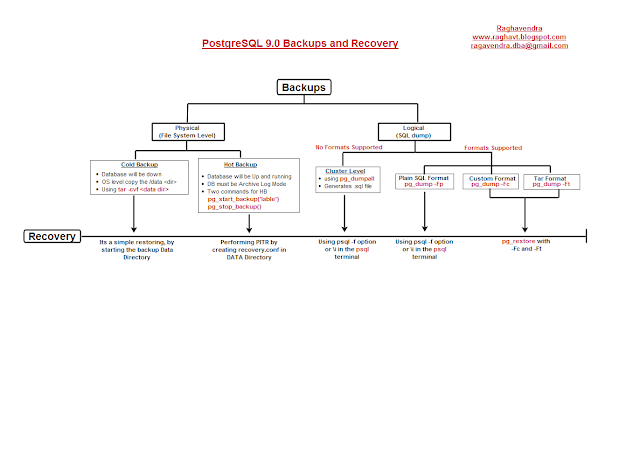 My pictorial presentation on PostgreSQL Backup and Recovery gives a complete conceptial idea. Looking into Diagram you can make out which backups can be used to restore or recover. pg_dump,pg_restore and pg_dumpall utilities used for logical backups. pg_dump and pg_restore will help in taking backups for Database level, Schema level and Table Level. Pg_dumpall used for cluster level dump. Three formats are supported with pg_dump, Plain SQL format, Custom Format and Tar Format. Custom and Tar Format dumps are compatible with pg_restore utility whereas Plain SQL format dumps are compatible with psql utility for restoration. Below are the examples for each Backup levels and with related restore commands. Note: Schema Level and Tables Level dumps can be performed in the same way by adding related options. There are very best way of taking dumps and restoring methodolgies. In particular, Simon Riggs and Hannu Krosing - "PostgreSQL 9 Administration Cookbook - 2010" book is good way to start with PostgreSQL Backup and Recovery published by www.2ndQuadrant.com. In cold backup, its a simple file system backup of /data directory when Postgres Instance is down, mean, to achieve a self-consistent data directory backup, the database server should be shut down before copying. PostgreSQL gives flexibility to keep pg_xlog and pg_tblspce in different mount points via softlink. While copying the /data directory including the soft link's data, use the below command. In Hot Backup, cluster will be up and running and the Database should be in Archive Log Mode. Two system functions will notify the instance about starting and stopping the Hot Backup process(pg_start_backup(),pg_stop_backup()). Before going forward with Online Backup, let's discuss on the Database Archive Log mode which is mandatory for Online Backups. Coming posts of mine will brief about PITR / Tunning WAL etc., presently we look into WAL Archiving. In PostgreSQL database system, the actual database 'writes' to an addition file called write-ahead log (WAL) to disk. It contains a record of writes that made in the database system. In the case of Crash, database can be repaired/recovered from these records. Normally, the write-ahead log logs at regular intervals (called Checkpoints) matched against the database and then deleted because it no longer is required. You can also use the WAL as a backup because,there is a record of all writes made to the database. The write-ahead log is composed of each 16 MB large, which are called segments. The WALs reside under pg_xlog directory and it is the subdirectory of 'data directory'. The filenames will have numerically named in ascending order by PostgreSQL Instance. To perform a backup on the basis of WAL, one needs a basic backup that is, a complete backup of the data directory, and the WAL Segments between the base backup and the current date. Configuring the archiving of WAL segments can be chosen by setting the two configuration parameter's archive_command and archive_mode in the postgresql.conf. Making the cluster into Archive-log mode requires RESTART. Note: % p for the file to copy with path used as a file name and % f without a directory entry for the destination file. For further information about the Archiver Process, refer to the post PostgreSQL 9.0 Memory & Processess. Step 3 : Issue pg_stop_backup() in psql terminal. Note: It is not necessary that these two functions should run in the same database connection. The backup mode is global and persistent. In PostgreSQL, there is no catalog to store the Start and Stop time of the Online backup. However, when online backup is in process, couple of the files created and deleted. pg_start_backup('label') and pg_stop_backup are the two system functions to perform the Online Backup. With pg_start_backup('label') a file backup_label is created under $PGDATA directory and with pg_stop_backup() a file 'wal-segement-number.backup' file created under $PGDATA/pg_xlog. Backup_label will give the start time and Checkpoint location of WAL Segment, it will also notify the PostgreSQL instance that Cluster is in BACKUP-MODE. 'wal-segment-number.backup' file under $PGDATA/pg_xlog directory describes the start and stop time, Checkpoint location with WAL segement number. Note: After pg_stop_backup(), backup_label file is deleted by the PostgreSQL instance. Do post your comments, suggestions.